Ruffle Cakes. Frill Cakes. Whatever you call them, I think we can all agree. They’re fabulous cakes! It’s hard to believe it, but we’ve been gushing over this incredible style of cake for several years now. Wisps of fondant so delicate and thin, they’re almost translucent. Gracefully encircling the cake in rows upon rows of beauty. 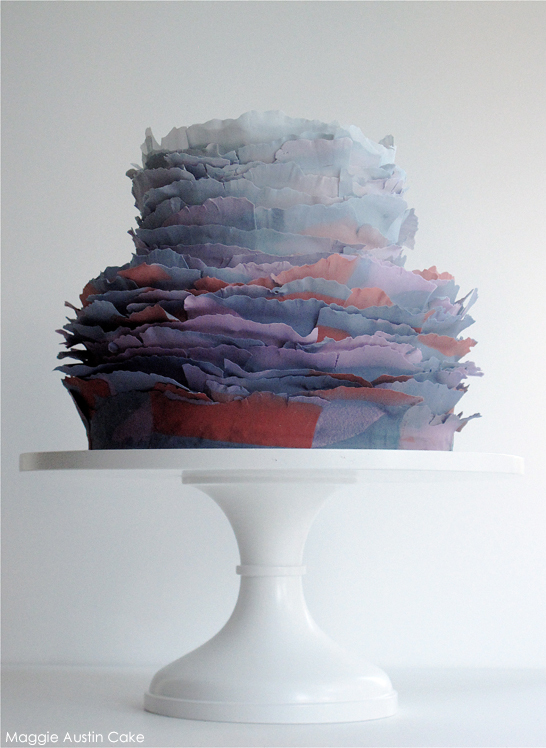 Many, many gorgeous ruffle cakes have graced the pages of this blog. And today we have a spectacular new design from the lady who put fondant frills on the map. And inspired one of the most popular cake trends going. Yes, Maggie Austin is back today! Sharing a deeper, darker, richer spin on her signature frills. 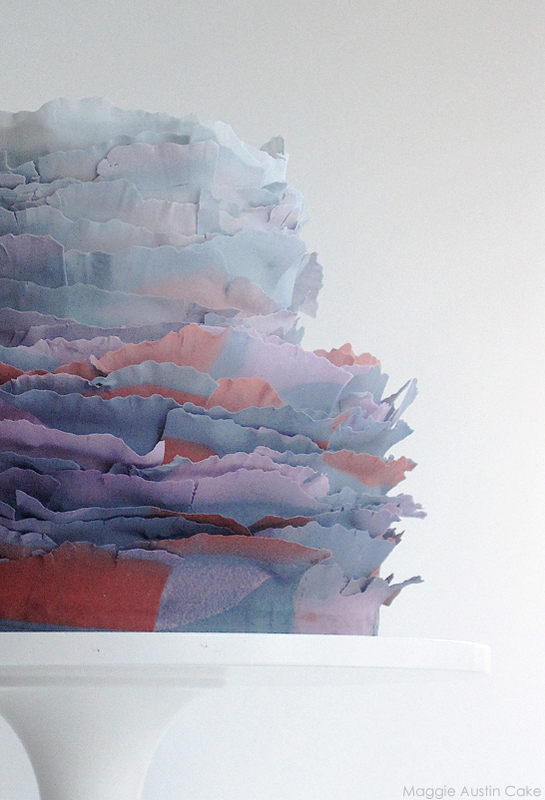 Shades of purple, red and blue are on display in this stunning Mottled Ombré Frills cake. Oh for the love of beautiful, fabulous frills. This cake is simply breathtaking! If you’ve ever wondered how Maggie creates her exquisite frill cakes, now you can find out first hand. She’s teaching a class online at Craftsy and sharing all of her insider tips, tricks and techniques! I just watched Maggie’s class from beginning to end. And I must say that I’m inspired to make a cake covered in frills. I spend so much time blogging now, and not as much time baking and designing. But Maggie’s techniques are straightforward and definitely achievable. Plus her calm and encouraging demeanor is just what you want out of an instructor. If you haven’t already checked out, you can find her Fondant Frills class on Craftsy HERE. A special thank you to Maggie Austin for sharing such a remarkable design with us! We’re always thrilled to have the Queen of Frills stop by! could you tell me where you get these wonderful cake stands from? eww…sorry but this is not one of Maggie’s best cakes and I’ve been her fan for a long time! Craftsy has some great classes and I did receive some info about this one but haven’t had the chance to sit down and actually look at it. Wow these are amazing! I’ve actually never worked with fondant before but it’s something I’ve wanted to try. Now looking at this cake really peaks my interest. Thanks for sharing! Just curious, if I’ve never worked with fondant do you think this would be hard to learn doing for the first time? sarah: found them yesterday online. are they yours? will order some soon. 🙂 love them! Such a beautiful effect and very delicate too!